Altar of Despair is a location in Bloodborne. The Altar of Despair is reached by breaking a window next to the Lumenflowers Garden lamp. There is currently no official lore mentioning Altar of Despair. Once you drop out of the window into the area you kill the two blue aliens and then proceed down the elevator which leads to Ebrietas Daughter of the Cosmos. For information on the boss fight, go to Ebrietas' page. If Annalise is slain (either by the player or by Alfred) and queenly flesh is acquired, interacting with the altar allows you to resurrect her. She would appear in her normal position in Cainhurst Castle afterwards. Rom's corpse is found here for some reason. Roms body is there because Ebritas wants to ressurect rom, keep in mind you can resurrect the queen from here. It literally explains why the altar is there and everyone is asking why it says for nothing. If you kill the queen of the vilebloods at cainhurst and get the queenly flesh I believe you take it there to resurrect her and she will be at cainhurst. Anyone know what to do with the spider you can inspect after the boss? So question : Lets say you kill Annalise and get her flesh, get to new game+ Do you still have the flesh and if so what happens when you put it on the Altar when that games Annalise is still alive? 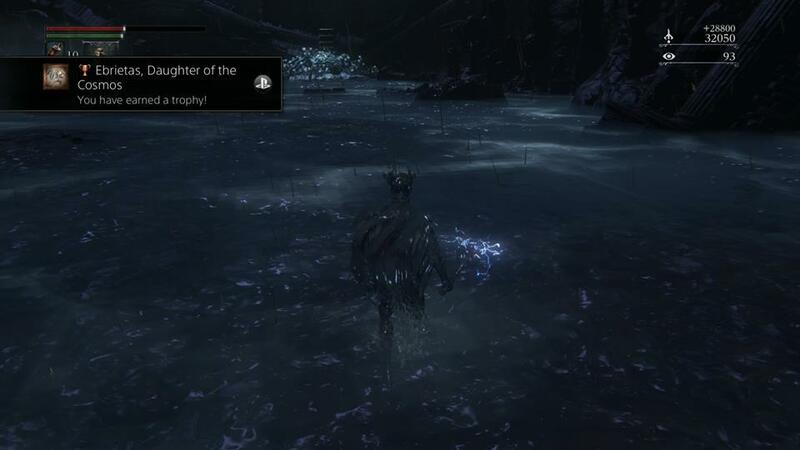 Do you have to kill ebrietas to use the alter on annalise? Or could I ignore the boss fight altogether and revive her anyway? Is it possible to take the skull of Laurence to the altar? This boss and its location reminds me a lot of Seath the Scaless boss fight. why is ebrietas looking at rom&apos;s corpse before you start the fight and after beating ebrietas how can you speak with rom&apos;s corpse ?